The Earth has dried out and civilization with it. Some of the survivors have managed to eke out a living on the Saltlands: plains left behind by a once great ocean. Adapting to their environment they use land sails with wheels on these flats. But the Apocalypse is not done with the Saltlands, from the west a storm of raiders, a terrifying Horde on gas guzzling machines approaches in search of their lost God. Only those among the first to escape have a chance! 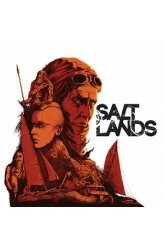 In Saltlands, the first group of players to find and reach an exit point wins, leaving the rest to the Horde. There are no fixed teams, players can decide to co-operate or backstab each other as they see fit. Each player starts the game with a single captain but may increase his crew as the game progresses. Each crew membe..